We meet at 2pm in Sapporo's Chitose Airport (CTS) which is the main airport in Hokkaido Island. 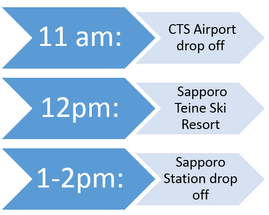 If you are unable to arrive by 2pm at the airport, you will either need to arrange a shuttle to Niseko on your own or arrive a day before and meet the group at CTS on day 1 of the trip. Further information on meet up/drop off is available at our Logistics page here. We arrive in Niseko via one of our 4-wheel drive "adventure vans" around 5pm. Our lodging in Niseko is within close walking distance to all of the fun amenities of the downtown Hirafu area. Our lodging gives us lots of access to everything Hirafu has to offer during the off-hours including bars, restaurants, the food truck spot, convenience stores, and of course the Niseko Hirafu ski base. Further information on this trips lodging can be found here. A short walk from our accommodation, the first day of Japan Pow is spent at the much-talked-about Niseko Resort. With 15 meters of snow per year and an average base of 5 meters, there's plenty here to keep you sufficiently busy all day. If the backcountry access gates are open you can do a hike to the summit and off the back or hike over to one of the back bowls. ﻿Located a 40 min drive way from Niseko, Rusutsu is Hokkaido's most famous tree skiing area. With no needlessly roped off areas, this place is an all you can tree ski paradise. The impressive lift network plus no lines ensures that you'll be good and tired at the end of the day. We pack up our things, check out of Niseko, and head 80 minutes away to Kiroro. The drive weeds out all but the most dedicated skiers and leaves this underrated resort ripe for some excellent lines. Ski amazing tree lines, open bowls, and never encounter any lift lines. After finishing with Kiroro, we head to Central Hokkaido in pursuit of snow which is even lighter than that found in the Niseko Region. The drive to Asahikawa is about 3 hours long, but we'll be making a stop in Otaru to get some of the freshest sushi available on the island. Unlike Niseko and Hakuba, Asahikawa isn’t frequented by foreigners and maintains a traditional Japanese air about it. Asahikawa isn’t a resort, it is a centrally located city with easy access to three different resorts which get vastly varying amounts snow depending on what the weather is doing. From the Asahikawa base, we'll have easy access to Furano, Asahidake and Kamui Ski Links. Ski Furano, a large hill by Japanese standards, this hill offers fun off piste runs on some great steep terrain. Furano, like many of its Central Hokkado ski resort counterparts, receives even drier and fluffier snow than Niseko. This fun resort is only 40 minutes away from our lodging in Asahikawa. Only frequented by locals and a handful of foreigners, you'll be amazed to look around and realize that you've got the entire hill to yourself. The smaller sized hill offers fun off piste off the back side as well as great tree runs in bounds as well. The smoldering volcano of Asahidake offers more lift-access backcountry than a typical ski resort. Consisting of just one tram that leaves every 20 minutes, Asahidake is where you can find the very best quality pow that Hokkaido has to offer. It can get so deep and light that its scary. There is an additional ¥10,000 per person charge for this option, which includes a backcountry guided tour. As this is backcountry access terrain, it is absolutely mandatory that if you choose this option, you have both the proper equipment and are at an advanced-expert ski level.